One of the questions asked most frequently before purchasing one of David's kinetic sculptures is, "How tricky is it to install?". Here is a video of kinetic artist Andrew Smith installing one of his whimsical sculptures and it could cause you concern. The installation of David's sculptures is nothing like the above experience. David has developed techniques for helping people install his sculptures easily. Several years ago we created a video showing David installing Crescent. While that sculpture is long gone, the technique shown is similar to all of his wall pieces. Much easier than the Andrew Smith piece! Yesterday, David and I delivered his large, mesmerizing, free-standing sculpture, Cognition to An American Craftsman Gallery in New York City. 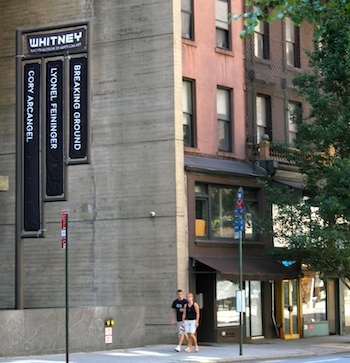 An American Craftsman has been displaying David's work in NYC for 20 years but recently landed some additional gallery space right next door to the Whitney Museum of American Art on Madison Avenue. If you live in the NYC area and missed the open house at David's studio you can visit the gallery to see this unique one-of-a-kind sculpture in motion. 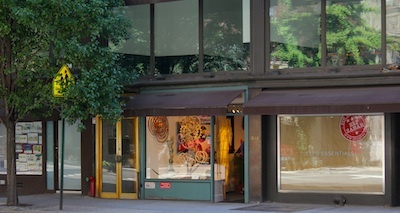 The gallery is located at 940 Madsion Ave. just above 74th Street. Cognition is on display in the front window and because it operates for 24 hours on a single winding, will be moving through the night. That is important in the city that never sleeps! 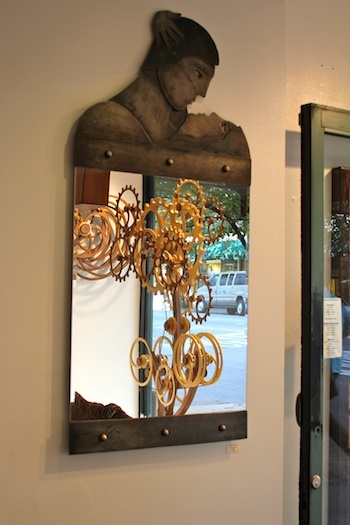 The gallery had a great selection of fine American crafts in wood, ceramic, glass and metal in addition to David's work. If you decide to visit NYC and the gallery, stop back here and let us know about your visit. Just a heads up though - there is on street packing on the opposite side- 2 hours and empty on Saturday AM. It is regulated with those charge card meter boxes on the corner and if you don't get back to your car quickly with your receipt in hand, you will get a ticket- voice of experience here! 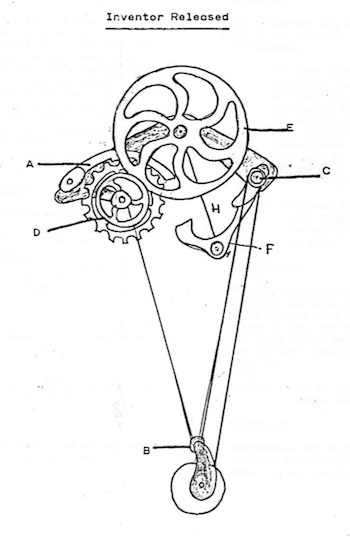 Directions for Your Kinetic Sculpture! 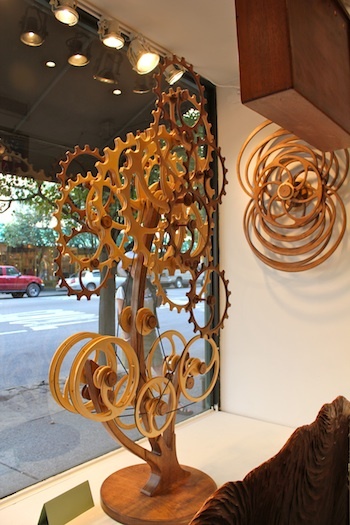 David has been creating kinetic sculptures for a very long time - since the 70's. And for each design out there we have created directions for the owners. This started long before we had a computer so many of the directions aren't in digital format. Here is an example of the illustration that is part of the Inventor Released Directions Packet. Others are in formats no longer readable by today's software. We have known for awhile that we needed to make this archive of directions available online but oh, what a job! Thanks to our daughter Amy that project is now well on its way to completion. She has scanned all directions that were not digital or could no longer be opened and she saved them in pdf format. She has also saved all directions that could still be accessed in pdf format as well. And she has uploaded them all, created links to their photos and made it all accessible to you. Available today is the the Wood That Works Directions Page here. 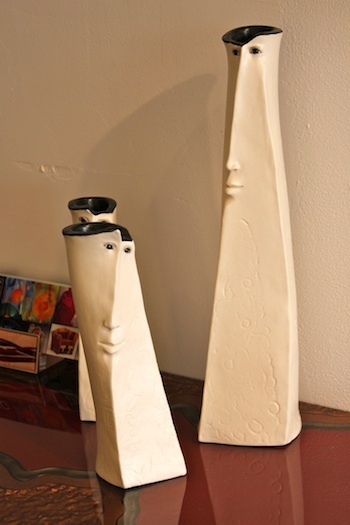 There is a phenomenal listing of sculptures created by David over the years. Now, the next time you need the instructions for your David C. Roy kinetic sculpture you can simply download a copy here. Many of the newer designs have online directions already. The most recent designs will be getting similar webpages and downloads as well. For years Marji and I have discussed the large outdoor sculptures we'd like to build. We never had the time. Last year, as we were discussing vacation plans Marji suggested taking a week off, staying home, no "real" work allowed, and building a sculpture. It was one of our best vacations. We decided to turn it into an annual tradition. We spent the past year collecting and discussing ideas. A few months ago I worked up some 3D sketches with my new favorite 3D program Strata Design 3D. We showed the drawings to our kids and others, made many changes and arrived at a "plan." I put plan in quotes because one of the best parts of this collaborative project are the changes that happen as we start actually building the piece and have to "think on our feet." The original inspiration was a photo of a sculpture by Elias Wakan. We liked the geometric feel of the sculpture and the way it moved in 3D space and connected back to itself. We decided to try something like it using 3 inch plastic pipe rather than wood. This was mainly for practical reasons. The pipe is relatively cheap and easy to work but also is impervious to weather elements. We were thinking large in scale and definitely an outdoor sculpture. We also thought plastic pipe would add some flexibility so we could define long curves - more on that in a minute. The final concept was quite different from the original inspiration as you can see in this animation. It includes about 120 segments, each 12 inches long bolted together side to side but offset by 1 inch. Our daughter Karen volunteered to join us on vacation and help with assembly. Work progressed nicely. I designed jigs for cutting and drilling the segments. It was important that the holes lined up precisely and for the most part they did. We assembled 6 foot segments in the shop and then moved to the yard for final assembly. Almost immediately we realized that these were far more flexible than planned. We all realized that in fact this was a wonderful feature, not a problem at all. A new sculpture concept was formed. The final form for now is shown in the photo series on Flickr. 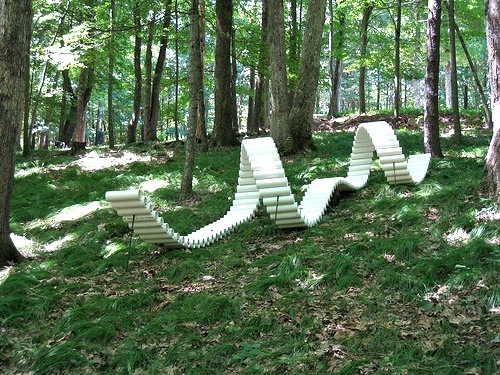 In reality the beauty of this piece is in its flexibility. We can rearrange it on the hillside whenever. I'm sure we'll see lots of variations as time goes by. 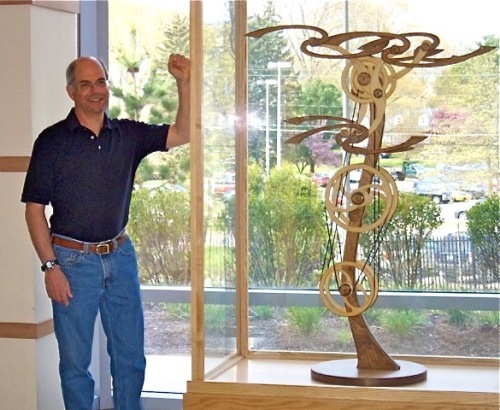 David installed Willow Wind at Eastern Connecticut State University on April 21, 2010. The kinetic sculpture is displayed in the new science building and was acquired by the university based on faculty requests. The juxtaposition of science and art continues to fascinate David. For more information on Willow Wind be sure to check it out in the archive section of the website.